Enter your username and password and click Login to start playing at any of the tables. Alternatively, click Browse to check out the table options in the lobby without being logged in. At any time, click on the Login button in the top right corner of the lobby to start playing at any of the tables. 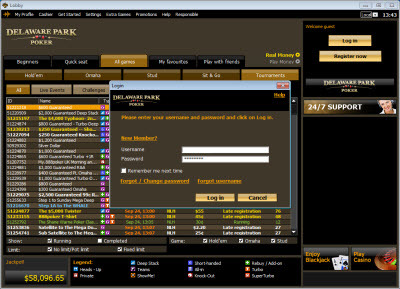 If you are new to Delaware Park Online click on the New Player to register. Fill out the registration form and click on Submit. We strongly suggest you write down your username and password and keep them safe and confidential. Delaware Park Online does not accept registrations from temporary or disposable email addresses. Now you are ready to log in and play poker! 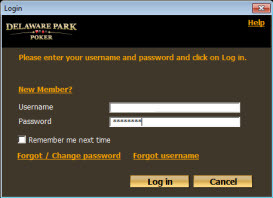 Mark the Remember me next time checkbox if you want your username and password to be entered automatically whenever you open Delaware Park Online from now on. Forgot your password? No problem. Just click on the Forgot your password link and enter your username and email address. 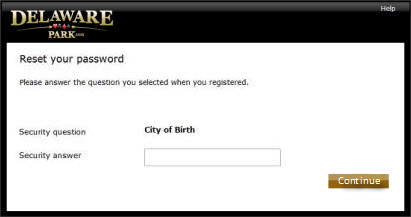 We will then ask you to answer the security question you chose when you registered. If you answer correctly, we'll send you an email with your password. If you didn't provide a security question and answer when you registered, just contact us directly.